It’s very rare that I see Meyer Lemons at my local Natural Grocers store. Yesterday I was lucky and in the cart they went. Back in my kitchen I decided on this Meyer lemon cream cheese coffee cake since I also wanted to use up some of the cream cheese that has been sitting in my fridge for a while. What a fantastic decision. 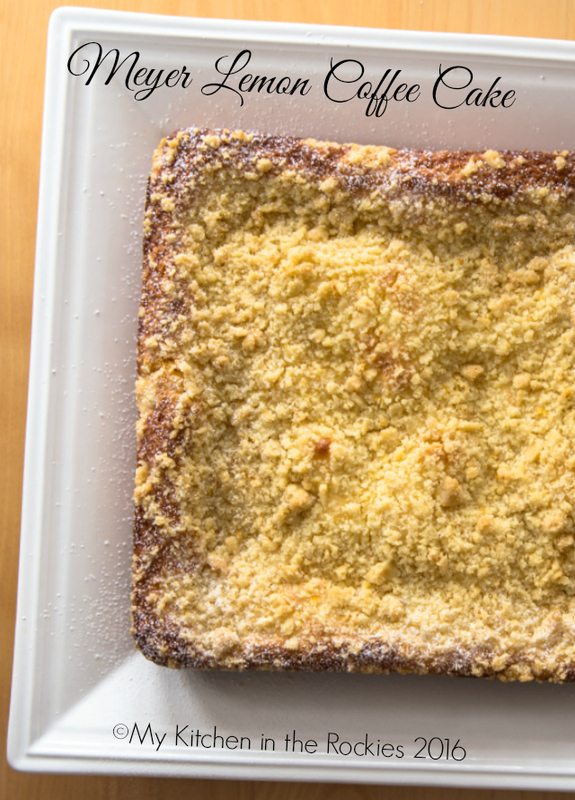 This Meyer lemon cream cheese coffee cake is light, creamy, and crunchy in one single bite. I also like that it is not too overly sweet. My “non dessert” eating husband agreed and ate two pieces in one sitting. Well, that says it all. 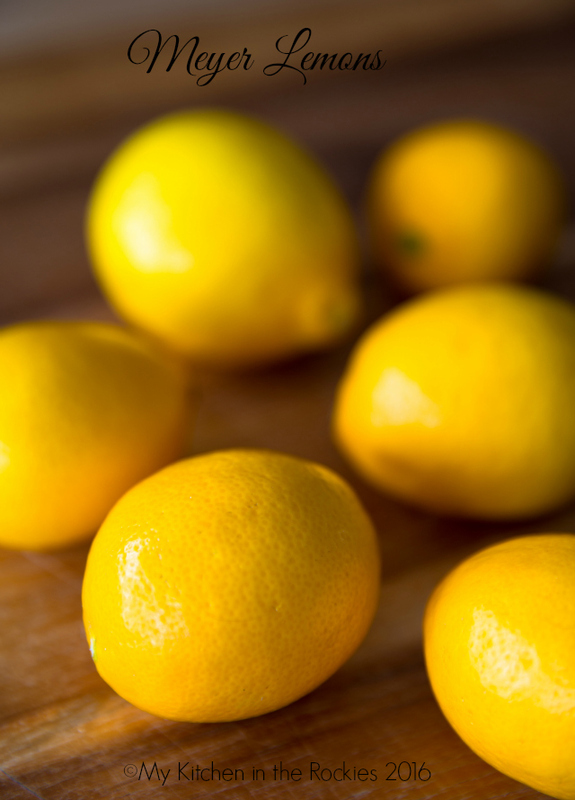 In case you can’t find Meyer lemons, which are a little sweeter than your regular lemons, you could substitute regular lemons and add a little bit more sugar to the recipe. 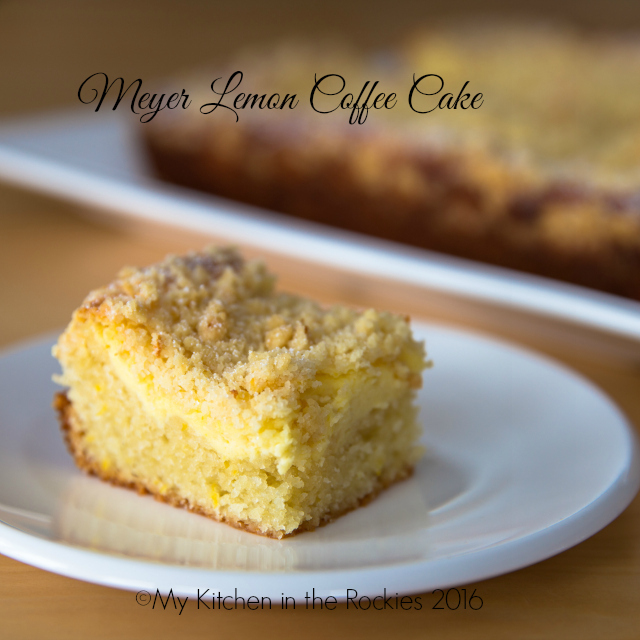 But hopefully you will be as lucky as I and get your hands on some fresh Meyer lemons to try this irresistible Meyer lemon cream cheese coffee cake. Enjoy! Butter an 8 x 8 inch baking dish and line with parchment paper. Make sure to have parchment paper hanging over the edges for easier removal of the cake later. Using a smaller bowl and a hand held electrical mixer combine the cream cheese, sugar, egg, Meyer lemon juice , and zest until smooth. Set aside. Using a smaller bowl and your hands combine the flour, sugar, zest, and butter until small crumbs form. Set aside (best in fridge!). 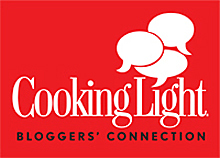 Using a stand-mixer combine the oil and flour. Add the yogurt, lemon zest, and lemon juice until the mixture is creamy. On low speed add the flour until just combined. Don't over mix! Transfer the batter into the prepared baking dish. Spread the cream cheese mixture evenly on top of the cake batter. Evenly distribute the streusel on top of the cheese layer. Bake for 40 minutes. Baking time may vary. Cut into 12 equally sized rectangles. Please use organic and GMO free ingredients for this recipe. Tip: Freeze leftover fruit zest and juice in two separate small Ziploc freezer bags for later use. Oh my! I need to make this. I love lemon like my mother did and this looks perfect.